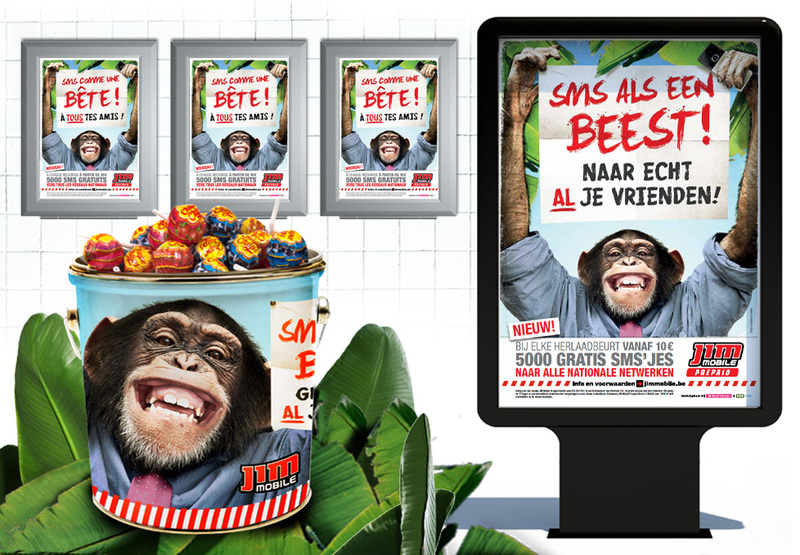 The market of mobile operators can be confusing to consumers: unclear formulas, time limited promotions, … A real jungle! And a great starting point for a new JIM Mobile campaign! Check out our beastly concept and wild creations! Being transparent and relevant has always been JIM Mobile’s philosophy. That’s what makes this unique youth brand stand out of the telecom market. The new JIM Mobile Prepaid offers 5000 free text messages to all national networks. Something our wild bunch of teen consumers will love! We wanted to show the consumer he shouldn’t hold back on texting with this offer. 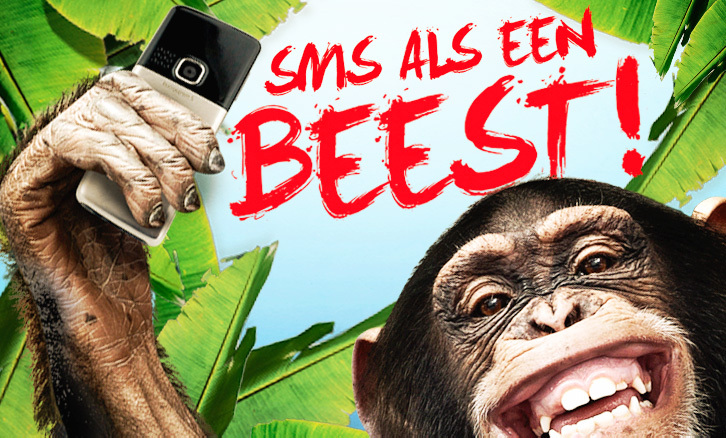 So we translated this idea into the headline: ‘Text like a beast with the new JIM Mobile Prepaid’. And what better way to illustrate this ‘beasty’ headline, to this wild bunch of teen consumers, than by using animals of all plumage imaginable having a great time! Laughing animals are perfect in every way! They’re both rare in nature and in advertising. 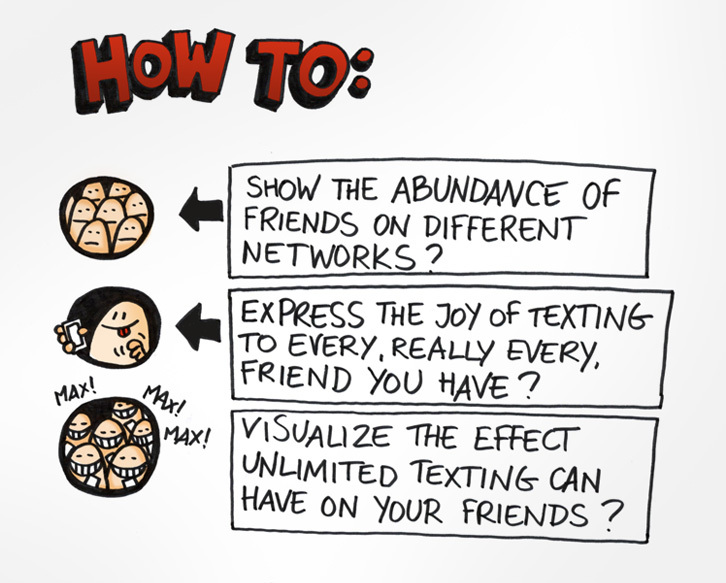 Reflecting human behavior is not only hilarious and irresistable, it’s also a great metaphor for ‘the all network texting proposition’. 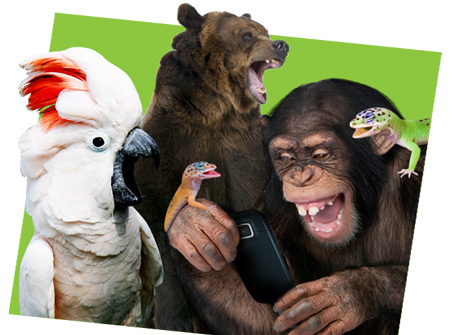 Just imagine every species being one of your friends on a different network. With this in mind, a silly story popped-up. The only thing we needed was the right nature footage and some awesome voice actors to go completely wild! Well what do you know, French animals sound just as funny. Or funnier even? En tout cas, une belle démonstration de ce qu’est ‘faire le singe’. Monkey shot at the Seven Mansion! We wanted the communication to be a perfect fit with the abundance of the proposition. Although we hired the best animation movie dubbing voices on the market we decided to do the animation in house at Seven. We aimed for this ‘Hey, I can do that myself!’ meets ‘Damn, how did they do that?’ look that JIM Mobile is known for. See more of it in our previous thumb and chin campaigns. 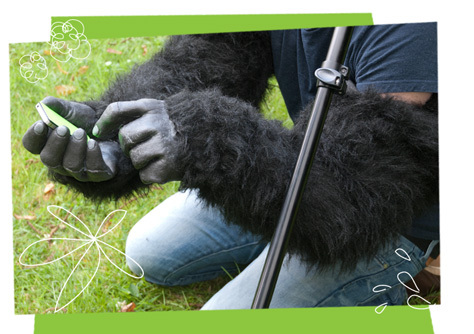 In spite of our thorough research, the money shot we simply couldn’t find in nature was the monkey texting in close-up. Over to a professional puppet maker to create some über realistic monkey arms. All set for a beasty shoot at the forests surrounding the Seven Mansion!